Last edited by Jenson's Understeer on Tue Sep 11, 2018 8:48 am, edited 1 time in total. End of an era. Despite the fact we all knew this was coming and it's probably time anyway, still can't help but feel a little sad! Is it a surprise his replacement is not announced? Why delay? It's a bit of a surprise to me, yeah. But remember McLaren announced Vandoorne was out only a day or two before they confirmed Norris to replace him, so it could well be coming before Singapore. I'll be very surprised if we get to the Singapore press conference and they haven't made an announcement, in fact. What if it's Lance Stroll? And off to Sauber. Madness! Kimi has posted on his Instagram page that he’s signed a 2 year deal at Sauber. Last edited by Charles LeBrad on Tue Sep 11, 2018 8:30 am, edited 2 times in total. Even with all the rumours, I still wasn't expecting that! So it should also be true Kimi will part own the Sauber team as well!!! Would seem a shame to throw away all those millions he earnt as a driver.. I think they not announcing Leclerc as of now is because Ferrari want all the limelight to fall on Raikkonen. Once all is settled in a day or two, Leclerc's announcement will be made setting heartbeats racing again! That is really a shock. I expected him to quit this season or the next, but to go to Sauber? Wow. Exit from Ferrari is not shock. But going to Sauber really is. Does he needs to fight for small points for two more years? With no podium in sight? Also, it becomes clear that why Ferrari did not take firm approach with number 1 and number 2 drivers. But I am kind of disappoint in Kimi, because when he became WDC with Ferrari, it was because his team mate helped him. Now he does not returns the favor back. Surely Kimi is not going for midfield fights. He's going there (as per rumours) as he'll become part owner of Sauber. Hopefully it'll be a mutually beneficial partnership that'll bring Sauber funding and investment to put them back at the front of the mid-field where he left them in 2001. A few more thoughts. if Bianchi did not died in the accident, Raikkonen would be already out of F1. Also, taking a seat in Sauber is not good for young hopes of lower series. When will they have a chance to take a F1 seat? Looks like Ferrari has really strong faith in Leclerc, since no other young driver is set to take his place at Sauber. F1 shouldn't be a charity. Sauber won't want to just be a feeder team for the bigger teams forever... They want to win as well. Taking the hot young unpredictable thing from the lower formula for eternity isn't going to help them improve. They've done that for years, a couple of years of experience in one seat won't do the team any harm. Be really interesting to see how Leclerc stacks up against Seb. He's impressed me so far with his outright speed. I can see him causing a few headaches for Vettel. Kimi to Sauber is a strange one for me. If Sauber maybe sign another young driver i can see why they'd want Kimi. If they keep Ericsson then it makes no sense. Wow fair play Ferrari, that's one of the more bold/exciting bits of transfer news from the last few years. I'm surprised they actually went for Leclerc given the inexperience but it's certainly exciting. Kimi must really love F1... maybe he wants to take Rubens record for most starts? According to the BBC, 'Keeping Raikkonen had been Vettel's preferred option'. Well yes, it would be wouldn't it! So how will Kimi react to team orders for the rest of the season now he's leaving and knows he's not got many more opportunities for a race win? It could get a little spicy. Remember Alboreto? I think it was Nigel Roebuck who called him the man who loved F1 the most. The only negative I can see at this point, is Leclerc not allowed to race Vettel. We saw what happened at Monza, where Vettel scuppered his own and Kimi's races, and I fear for Leclerc. Kimi's pole position was embarressment enough. I felt that Leclerc was doing a fine job for himself, and for bringing Alfa Romeo the exposure it needs. Kimi joining them and his very first team wasn't what I expected, but I think it could work out very well indeed! Best of luck to both Kimi and Charles. I cannot recall the last truly shocking F1 news I heard. I mean, Alonso retiring from F1 earlier wasn't much of a surprise. Ricciardo switching to Renault, I didn't expect but can understand. Even Rosberg retiring as WDC, which I didn't expect wasn't all that shocking. Leclerc to Ferrari - fine, roughly what I expected. Kimi to Sauber... I did not see that coming. I'd have bet on me driving the Sauber next season before I'd have bet on Kimi. I'm not having a go at him, but I've generally assumed he's mostly stayed in F1 with Ferrari because it's a cushy job (in terms of car and it's fairly prestigious), he's not #1, he's getting paid a lot and he's already got impressive credentials of wins and a WDC. Maybe I've been doing him a huge disservice with that line of thinking, but wow, surprised at that part of it. so does this mean we can finally put to bed those persistent rumours of a Vettel team mate veto? Hallelujah! Ofcourse not, next year the "He has a No 1 clause in his contract" will take over from where that stops, also the Leclerc is not allowed to race Vettel. Last edited by Rockie on Tue Sep 11, 2018 10:04 am, edited 1 time in total. Just a wild thought here, but I seem to recall there were claims before the summer that Kimi had been offered a two year extension deal with Ferrari. Now he's effectively doing a seat swap with Leclerc after the latter had already signed a contract with Marchionne, I wonder whether the delays in announcing things have been due to the fact that Ferrari may have ended up with two contracts and one seat? Is it out of the pile he has already, or instead of the pile he does not get for the next 2 years? Last edited by moby on Tue Sep 11, 2018 10:20 am, edited 1 time in total. I remember it being said a few months ago that Leclerc wouldn't need a new contract because he was already on a Ferrari contract, he was just placed at Sauber but Ferrari could theoretically put him in the main team whenever they wanted. Sort of like how Red Bull/Toro Rosso contracts work. With Kimi moving to Sauber, can we safely assume that big things are expected / gained at Sauber as per investment / development for Kimi to go there? What did Monza have to do with Kimi not being allowed to race Vettel? If anything, it indicates the opposite. Sauber and Kimi is a good fit as he is a tidy fast driver who will maximize points in the mid field. I think Vettel will prefer this too in time as LeClerc will be a clear No.2 who has to follow team orders. However if he can keep another car in between him and Vettel team orders will be irrelevant and moot. Kimi just likes and enjoys driving, good luck to him and if a car and its tyres totally suit him he is still a speed demon. p.s. don't need to find a new signature as Kimi's acerbic wit will still be with us . My immediate thought was that Ferrari may have been negotiating with Sauber to take Raikonnen so he can be kept “match fit” just in case Leclerc struggles next year. This would then allow for a straight swap back. Brundle is siding with me. 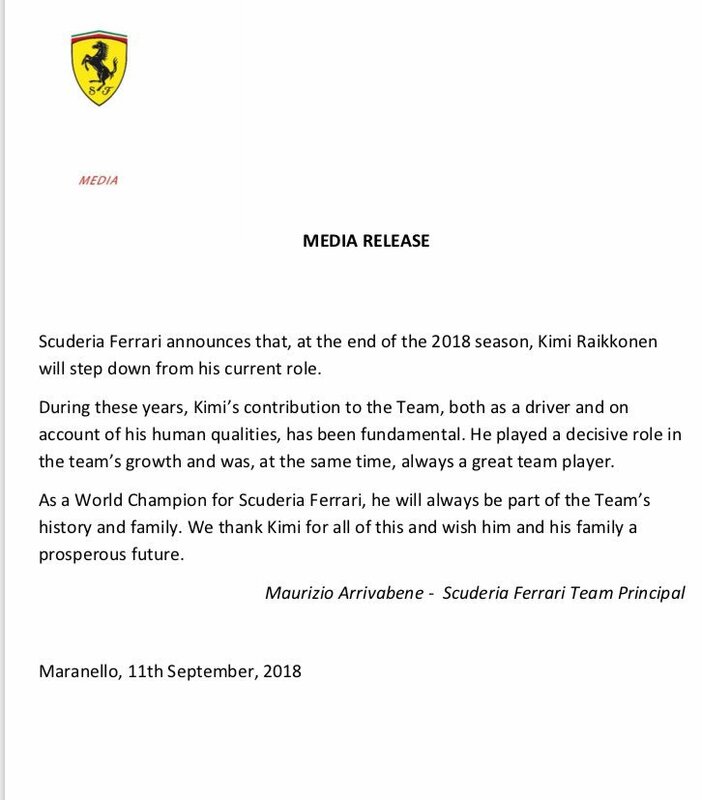 This was actual one of the rumours going around that Kimi was going back to Sauber, it would be interesting to find out who started that rumour for future reference.